Palace Decor is the latest to pledge support for the McDan ITF World Tour tennis scheduled from April 29 to May 5 in Accra. CEO of Palace Decor, Ahmed Ezzedine in a brief presentation ceremony at its Spintex office in Accra said “Not every child can play football, so if we some who have made their intention clear that they want to take tennis high, why don’t we support them.? “We at Palace believe in support sports promotion in the country, and so when McDan approached us for support, we didn’t blink an eye. Ahead of the presentation, Dr Daniel McKorley, McDan Group CEO, charged players of this year’s International Tennis Federation (ITF) World Tennis Tour Juniors, particularly the Ghanaians to utilise the platform to the fullest. The tennis governing body, ITF has certified the McDan West African Tennis competitions after five years of well-organized competitive tournaments. And to the McDan boss, whose affiliation with tennis in the country has taken the sport a notch higher, the certification offers the players a unique opportunity to demonstrate quality play. 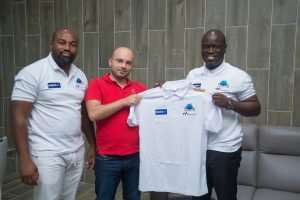 He said in a statement signed by Mr Nathaniel Attoh, the Tournament’s Director that “I charge all the players to demonstrate true spirit of sportsmanship. Having secured ITF certification, l would like to urge you all, particularly my Ghanaian compatriots to show to the world that given the chance, you will go places. The juvenile version (ITF World Tennis Tour Juniors) involving 18 countries from Europe, USA and Africa began on Monday at the Accra Stadium, and it is expected to end this Saturday. The main McDan ITF World Tour Seniors is scheduled from April 29 to May 5, also at the Accra Stadium.